Range Rover Evoque Convertible previewed | What Car? 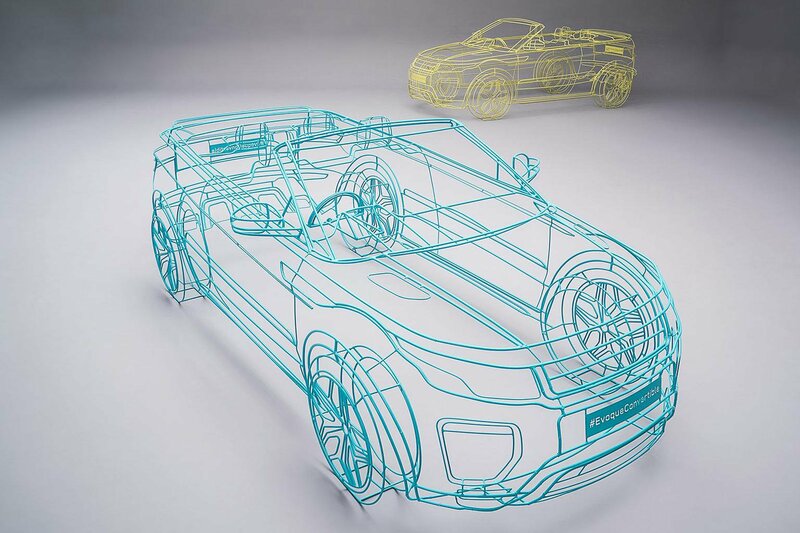 A convertible version of the Range Rover Evoque will go on sale in 2016, and the car has been previewed by a series of wire sculptures placed throughout London. The Evoque Convertible was confirmed at the Geneva motor show in March, with Jaguar Land Rover showing images of a test car being driven through the tunnels of the Crossrail project currently being built beneath London. JLR says the full-size wire sculptures used to preview the Evoque Convertible are accurate thanks to the use of computer modelling - they also include 3D wheels and wire-formed front and rear seats. The car’s existence confirms an open secret that Land Rover has been preparing a convertible version of the Evoque, having first shown a concept version of such a model in 2012. What Car? also reported in 2013 that the convertible had been given the green light, but this is the first official confirmation of it going on sale. The production Evoque Convertible will be built at Land Rover’s Halewood plant alongside the five-door and three-door coupe versions. There are no further details on the Evoque just yet, with Land Rover saying more information will be revealed later this year. This may include information on the convertible's off-road ability and how it compares to the standard car. Engineers will also have worked to solve any issues with body rigidity and handling which have arisen through the loss of the Evoque’s roof.